Perhaps you've had a chance to use one of our Wood Cleaners already, and now you're looking for a product that takes your wood products' shine to the next level. At Furniture Clinic, we believe in seeing the job all the way through, and we're not satisfied with simply giving the wood's surface a thorough clean. Our team of specialists worked hard to develop products that would make the appearance of our wood even better, and longer-lasting, and from that initiative we developed our line of Wood Oils and Waxes. A beautiful oil to use with endless applications. Improved penetration, durability and drying time. 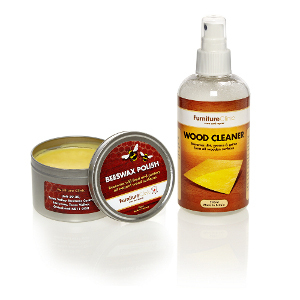 Beeswax feeds, protects and enhances the shine on all wooden surfaces, natural and finished. Above all else at Furniture Clinic, we value our mission to provide products online that are suitable for a wide range of purposes and applications. It’s not our goal to create one-size-fits-all products, instead, we strive to create versatile solutions that you can depend on time and time again. When you partner with Furniture Clinic, you get quality, you get dependability, and you get the support of a team of specialists that will help guide you to the perfect products for your custom needs. To achieve our mission of individualization, we strongly encourage you to reach out to our team of experts with any and all questions. Not sure whether you need the Boiled Linseed Oil or the Wood Oil? Uncertain if the Wood Wax Care Kit is the right choice for you? Whatever your question may be, we’re always a quick phone call away to provide assistance and recommendations. At Furniture Clinic, we make products for you – and our online collection of Wood Oils and Waxes are just one of many collections that are inspired by you, too. Shop online today, and discover the value of adding extra shine and customized attention to your wood products.